Instead of importing the entire contents of a template, you may only want to import a few drawings or a palette. In this case, use the Open As Folder command to import the items you want. 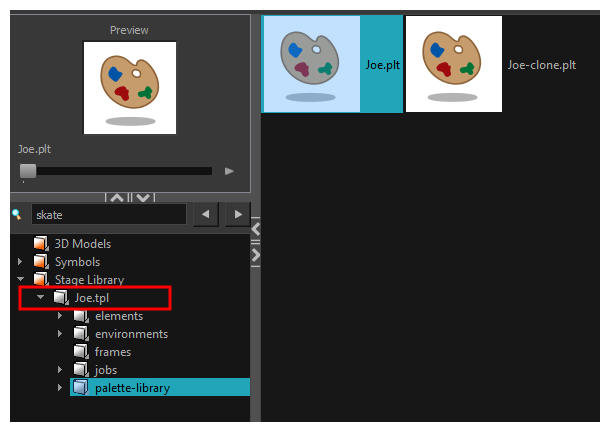 If you want to import a palette, simply drag the palette file into the Palette list section of the Colour view. In the Library view, select the folder that contains the template to open. If the library folder is locked, right-click on the folder and select Right to Modify. Right-click on the selection and select Open As Folder. In the library list section, click on the template's folder to display its content. Drag the content to the Timeline or Colour view.